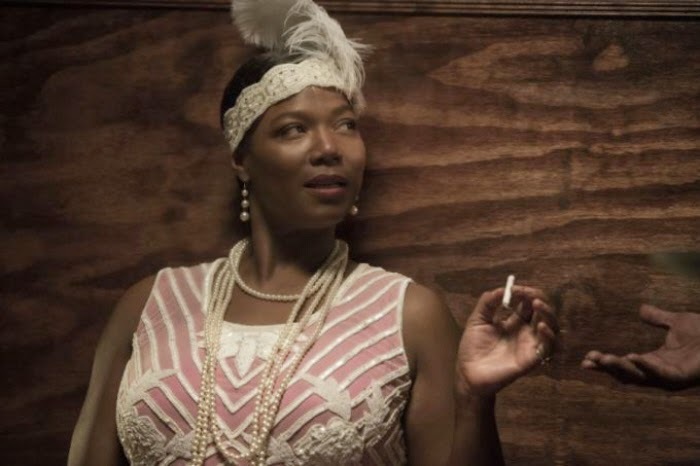 After being teased and tempted, HBO has released the official trailer for the upcoming Bessie Smith biopic, Bessie. Exciting! Directed by Dee Rees (who should have gotten all the awards for 2011's Pariah), Bessie stars Queen Latifah as the Empress of Blues, alongside a top-notch batch of co-stars that include Mo'Nique (as the 'Mother of the Blues', Ma Rainey), Michael Kenneth Williams, Tika Sumpter, and Mike Epps. The film will chronicle Smith's rise into prominence beginning with her early Vaudeville days to her blazing the trail in a mostly male-dominated jazz world to become one of the most influential and successful artists of her time. As a sucker for stylish biopics, divas of yore, and costume-y period pieces, I've been excited for this film since it was first announced, and have applauded Latifah (who's been deserving of a meaty acting role worthy of her talents for the longest!) for sticking to her guns and pushing for decades to bring Smith's fascinating life to screen. From the full trailer, the film looks like it's going to be a blast to watch, and appears that it will more than likely cover the torrid sway and swing of Smith's wild personal life, bringing ample attention to the many stormy affairs Smith had with men and women, as well as some add some depth to the fuzzy and racially-tinged circumstances surrounding the car accident that tragically took her life in 1937. If you're unfamiliar with Bessie Smith or have an interest in the early 20th Century era of jazz and blues, then whip out a pen and mark your calendar for Saturday, May 16th for Bessie's premiere date on HBO.